A Floater of a Good Time! So, in an effort to make new friends and discover this great city of mine, I recently joined several interest groups at Meetup.com. And, when most of my friends left town, leaving me to fend for myself this weekend, I managed to find a really fun group to join Saturday night. The group was fantastic! About 20 of us young professionals traveled to Brooklyn to see the Floating Kabarette, a variety and comedy show complete with Cabaret dancers, gymnasts, and magicians. After playing musical chairs throughout the evening, I was able to meet everyone in the group, including Lauren, who lives just a few short blocks from me here on the UES. I experienced a most unusual and unexpectedly fun evening, making a few new friends along the way! This month has quickly become one of the wettest Junes on record in NYC history with rain nearly every single day. So, many summer activities that New Yorkers look forward to--like baseball games, outdoor movies, outdoor theater, and concerts--continue to be cancelled. Carrie and I had planned to go see an outdoor production of King Lear in Battery Park this evening after work. But, after arriving and apprising the dark clouds over our heads, we thought it best to not stay in the open air. Luckily, Mrs. Mitchell (Carrie's boss-lady) had two extra tickets on hold to see Waiting for Godot at the Studio 54 box office. She offered them to us. So, we quickly headed uptown in the hopes of arriving in time for the 8pm performance. Along our walk to the theater, I stopped at Cosi to purchase an egg-salad sandwich to curb my ongoing hunger pains. While Carrie entered the theater to claim our tickets, I stood outside to finish eating my sandwich. You can imagine my surprise when Cloris Leachman walked up right behind me and started talking to the couple standing next to me. I was tickled pink and rushed over to get Carrie's attention to point her out . . . only to turn around and see Martin Short standing next to me in the Will Call line! After getting settled in our seats, I saw Cloris again and slowly watched her settle into the seat directly behind me anticipating a dramatic performance. And, we were not disappointed! Nathan Lane, John Goodman, Bill Irwin, and John Glover all delivered an amazing performance! I finally returned safely home this morning after a long trip out West. The first week was spent keeping the masses under control for all our meetings and marketing presentations at Licensing Show. We arrived at our weeklong accommodations at THEhotel late Sunday night. 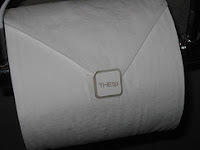 Everything at THEhotel is deliciously called "THE"--THE cafe, THE lounge, THE lotion, THE shampoo, even THE tp . . . I loved it! After a full schedule of meetings all week, I drove to So-Cal for a visit with the family and friends. I was so excited to give my nieces and nephews a hug & kiss in person! It felt so good! Upon my return home, I stopped back at THEhotel for a night to wish Crystal a happy 30th birthday in Sin City. It was so good to spend a little time with all my friends and to help celebrate such a special day with Crystal!